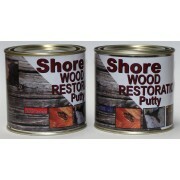 Shore Wood Restoration Putty Resin Paste AR25 (Yellow) – Hardener Paste AH25 (Brown) Epoxy wood filled adhesive putty. Mix ratio 1 : 1 by volume. Most versatile. High strength, no - shrink paste to fill, repair and replace wood and other materials in structures, walls, floors, furniture, window s.. 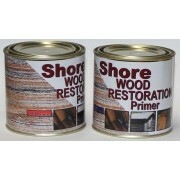 Shore Wood Restoration Primer Resin LR3X Liquid - Hardener LH3X Liquid Thin liquid to reinforce, rebuild and waterproof wood by hardening after penetration. Regenerates rotten, spongy and damaged window sills, frames, structural and decorative parts, furniture, columns, boats, floors, wendy house..